Today is Grenville birthday and it's also National Ice Cream Day (really). In 1984, President Ronald Reagan designated July as National Ice Cream Month and the third Sunday of the month as National Ice Cream Day. This year it's on Grenville's birthday. He ordered one of his favorites, baked haddock and was patiently waiting for me to take a photo before enjoying his meal. 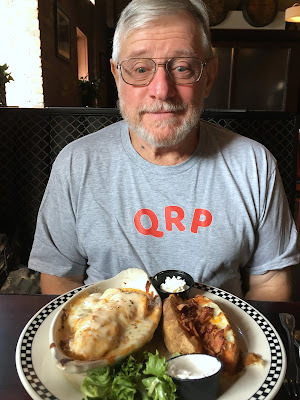 The QRP letters on his shirt stand for reduced power in ham radio "speak." It's his newest interest. Of course, no birthday celebration is complete without dessert, and his choice was the "Green Monster" mud pie with mint ice cream and chocolate fudge sauce, whipped cream complete with a birthday candle. 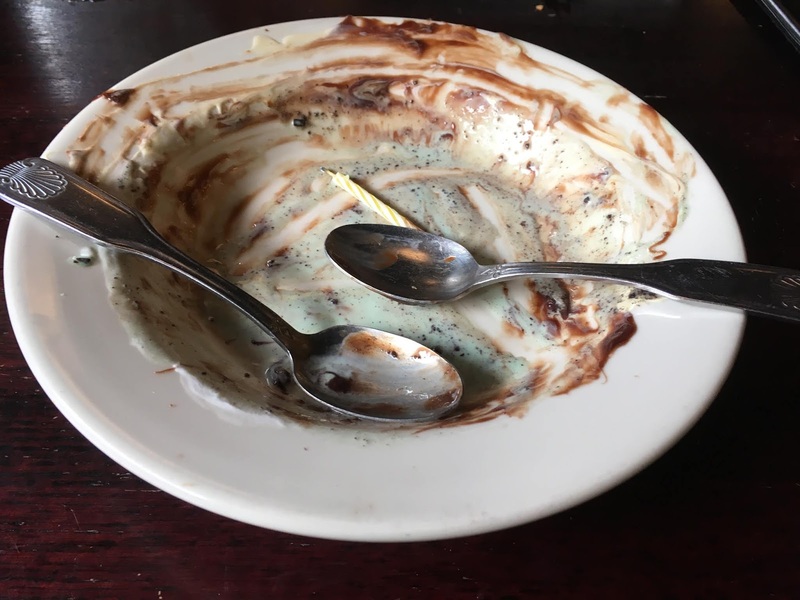 He graciously shared — and then there was none left. Most likely we will celebrate again with ice cream. After all, we wouldn't want to ignore a delicious presidential decree, would we? That is a special birthday for sure, and the food is exceptional. Happy Birthday to your best friend and hubby! Happy Birthday and wow on that plate, on both those plates in fact. Happy Birthday to Grenville! Many happy returns of the day! The meal looks festive and delicious. Well done on that meal Grenville! A belated Happy Birthday to ya. 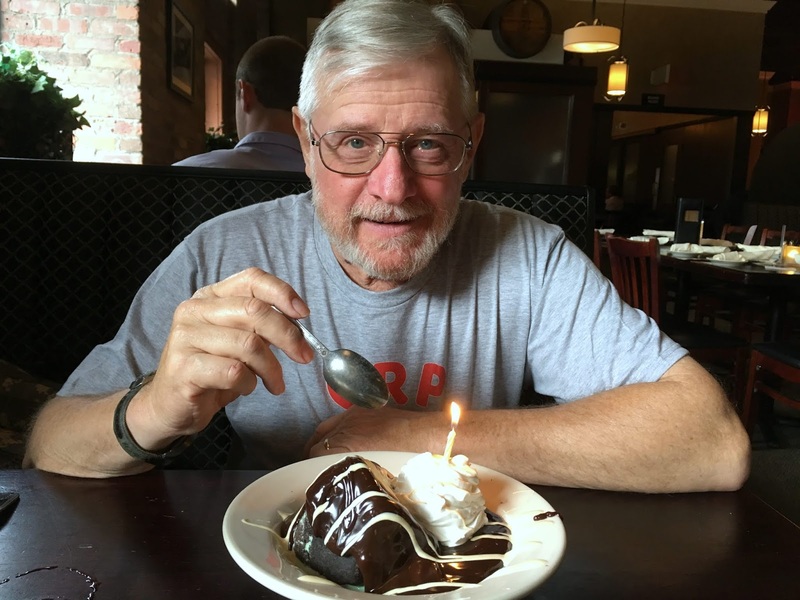 a very happy birthday to Grenville, and it looks like you celebrated in fine fashion! A huge Happy Birthday, Grenville. You had a perfect meal too. That sure looks like a fantastic birthday meal and it's on the house which makes it even better. :) Delicious looking dessert and glad you are following the presidential decree. Hope you had a wonderful birthday celebration. Thanks for stopping by my blog and leaving a comment. Enjoy the day! Happy birthday Grenville. You had a very good day with your birthday dinner and ice cream. That's a pretty good birthday present. Happy birthday to Grenville! Looks like dinner and dessert were both delicious. Strange how looking at food makes me feel hungry. Just looking at the Green Monster has my mouth watering. I hope Grenville had a lovely birthday. I sure hope you ignore all the decrees of the president you have now! What a great meal to celebrate a wonderful person :) Happy Birthday, Grenville!! How wonderful, a lovely celebration. Happy Birthday Pat! You two know how to eat. That all looks great and it would be a fun place to celebrate. Happy Birthday sir.